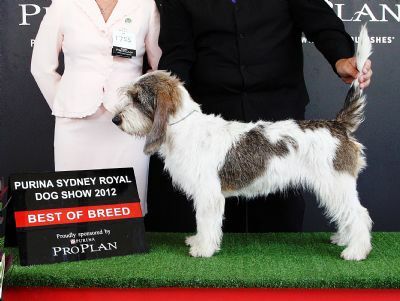 Maddie is one of the most successful Grands in Australia and will go down as one of the most important dogs within the breed in it's early years in this country. She has been awarded BOB at Sydney Royal 2012, 2014 and 2016, with RUBOB in 2015; Melbourne Royal BOB 2011, RUBOB 2015 & 2016, and Canberra Royal BOB 2014, 2015 with RUBOB 2016. She has never failed to be placed BOB, RUBOB or BCC under international judges in these competitions, and only missed 2013 due to motherhood. Her offspring are now following in her footsteps with Melbourne and Canberra Royal BOB's under their belts too. 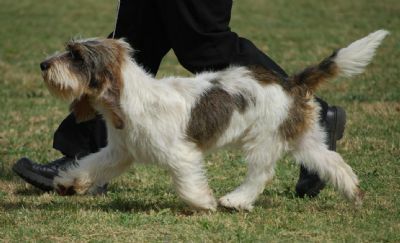 Maddie was the first Grand Basset Griffon Vendeen ever to be shortlisted in the hound group at Sydney Royal - ever. A fantastic accolade for a rare breed in Australia. She has been awarded every class in group, RUBIG's and BIG's. Despite her unique record of achievement under international judges she has never cracked the big wins in Australia, an interesting situation, yet this has never dampened her spirit or lessened her enjoyment of the ring. She has never been heavily shown and has succeeded with such longevity in the show ring due to her unique qualities and appreciation by so many judges, national and international. She gained the points to be awarded the title of Grand Champion in 2016. 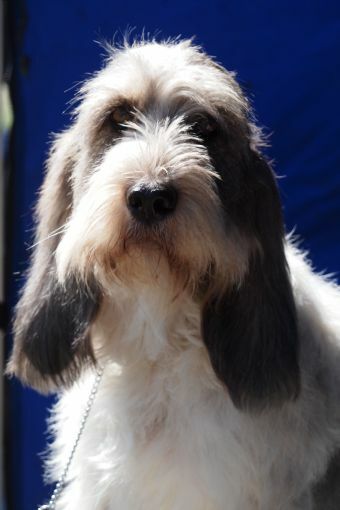 We are exceptionally proud of our home-bred girl at Laserre and applaud everything she has done for the Grand Basset Griffon Vendeen breed in Australia.